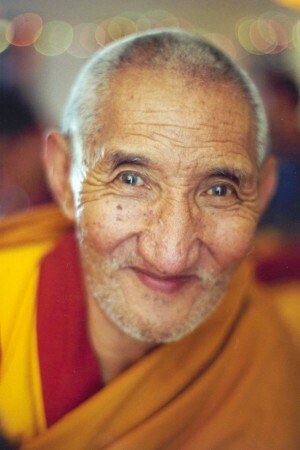 The great yogi, Ribur Rinpoche, (Mandala June 2001) was in Taos, New Mexico, recently for week-long teachings and public talks. Massimo Corona, executive director of FPMT, Inc., took the opportunity to ask him how Westerners who take robes can retain their vows for a lifetime. Even after 15 or 20 years, many Westerners give up being monks and nuns. Some cite lack of community support as the reason; others say it is the difficulty of keeping all the vows. Ribur Rinpoche gives some of the answers through his translator, Fabrizio Pallotti. The very first thing that is needed [before even considering ordination] is to have the mind subdued by the force of the lam-rim practice. What makes the difference between those who stay and those who leave is whether or not the person has been successful in subduing his or her mind. If the mind is not subdued, after a while it gets overwhelmed with delusions and on the basis of that people disrobe. The transformation of abandoning the household life and entering into the perfect conduct (rabjung) is based on the force of renunciation; and that can only come about with lam-rim practice. So the mistake is not relying enough on lam-rim practice.